This chapter aims to analyze if entrepreneurial leadership, regarded as a distinctive feature of entrepreneurial processes, represents an essential element for obtaining satisfactory innovation performance in an emerging context such as Colombia in Latin America. 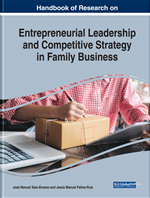 The relationship between entrepreneurial leadership and innovation management works differently in family firms (FF) compared with their non-family counterparts. Indeed, there is no consensus in the literature on the effects of entrepreneurial leadership on innovation success in family small and medium-sized enterprises (SMEs). Exploratory research has been conducted considering a survey held on family SMEs in Colombia. Results highlight the importance of supporting entrepreneurial leadership in order to achieve the innovation goals in these types of organizations and show how these factors change between family SMEs with family CEOs and non-family CEOs. In this sense, although the focus in this chapter is on FF, the conclusions could be to some extent generalized to SMEs. One of the critical factors for firm survival and growth along time is achieving a sustainable competitive advantage. This competitive advantage, based on different competitive strategy capabilities (Chirico, Sirmon, Sciascia, & Mazzola, 2011; Dawson & Mussolino, 2014) and the difficulties of competitors for imitating them (Gedajlovic, Carney, Chrisman, & Kellermanns, 2012; Le Breton-Miller & Miller, 2006), gets sustained through continuous innovation. In this sense, continuous innovation involves balancing simultaneously opportunity seeking activities, also known as exploratory innovation, and advantage-seeking activities, also known as exploitative innovation (Randerson, Bettinelli, Fayolle, & Anderson, 2015; Chirico & Salvato, 2008). The strategic integration of both exploratory and exploitative innovation, known as organizational ambidexterity (O’Reilly & Tushman, 2008), may vary depending on the specific characteristics of the organizations. Most companies worldwide are small and medium-sized enterprises (SMEs), specifically family SMEs (Berrone, Cruz, & Gómez-Mejía, 2012; Lumpkin & Brigham, 2011). However, research on the innovation-related topic in family businesses remain under-examined (De Massis, Frattini, Pizzurno, & Cassia, 2015; Schepers, Voordeckers, Steijvers, & Laveren, 2014; Steiger, Duller, & Hiebl, 2015; Voordeckers, Van Gils, & Van den Heuvel, 2007). There is a knowledge gap about how some of the most typical and distinguishing variables of family firms (FF) influence their innovation strategies. The interaction between the family and the business is the main difference between family and non-family firms (Boling, Pieper, & Covin, 2015), which may affect the style of management (Le Breton-Miller & Miller, 2006), entrepreneurship (Goel & Jones, 2016), and strategic decision-making (Sciascia, Mazzola, & Chirico, 2013; Boling et al., 2015). The primary goal of FF is survival (Cruz & Nordqvist, 2012), so as these firms are obliged to incorporate innovation into their strategic process (De Massis et al., 2015) as it is considered as a source of differentiation and value creation. Also, innovation helps to improve organizational efficiency and diversification. Family Firms: An organization where one or more families have control of the ownership of the business as well as active participation in its management. Competitive Strategy: The long-term plan of a company to gain a competitive advantage and a superior position in the market and industry. Entrepreneurial Leadership: A leadership role performed in different types of organizations, where it can appear with different forms and manners. Global Players: Important businesses that operate worldwide and which have a significant influence on their economies, as in the United States, Germany, Switzerland, Mexico, Brazil, and Spain, among other countries. Innovation: Related to successfully developing new or significantly improved goods or services, processes, marketing, and organizational methods. Achieving higher levels of innovation must be the aim of businesses in order to compete in more global and competitive markets. Organizational Ambidexterity: The strategic integration of both exploratory and exploitative innovation. Continuous Innovation: Involves balancing simultaneously opportunity seeking activities, also known as exploratory innovation, and advantage-seeking activities, also known as exploiting innovation.